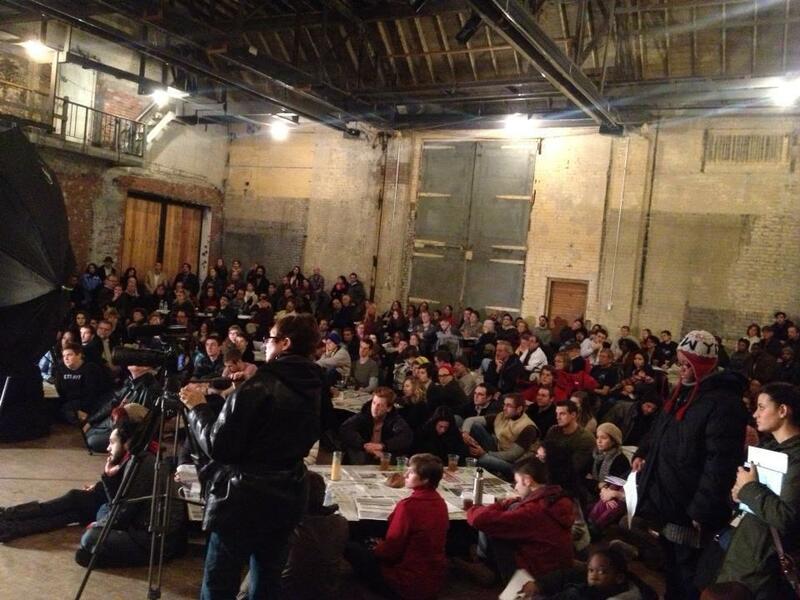 At monthly Detroit Soup meetings, attendees pay $5 to hear ideas aimed at improving the community, then vote on which creative project will receive the money raised. The Empowerment Plan, an idea first pitched at Soup in 2010, now distributes thousands of sleeping bags each year to the homeless. We are afraid of pushing back against the dominant narratives, of seeing struggle and hardship as community issues rather than individual failings, of betting on our neighbors and ourselves. This fear is cutting us off from growing our community and from offering support, empowerment and education. Recently, I was asked what it was like to start a non-profit in Detroit. Unlike this desperate family, I have been high-fived, patted on the back, and applauded for my efforts. My non-profit, Detroit Soup, has been featured in books, magazines, newspapers and blogs. Videos have been made for large corporations and the White House, and have even been shown on Delta flights from Detroit to San Francisco. And yet I can’t seem to raise funds beyond a few months at a time. It took me years to assemble a board of directors to help fundraise. I can’t hire a staff because I can barely pay myself. And I’m not alone; a lot of Detroit non-profits are just eking by, especially ones that are less than five years old. Individual donations aren’t coming in by the truckloads. They are trickling in, and those who are well-connected are getting much more than those who are new at trying something new. While conventional wisdom would say that the scarce resources should go to the more experienced (and thus well-connected), Detroit’s situation is such that we can’t have too many new ideas and too much new passion. We need the innovators and risk takers here. Instead, we are losing talent. Last year I watched four Millennial leaders – the very people all of us, from the governor and mayor on down, say we need – leave their non-profit jobs in Detroit. Two of them left the state because they couldn’t get funding. All of them had won awards, received recognition in national and international press, and committed themselves to creating meaningful change in the community. This is a glaring problem. For a community entrenched in poverty, we tend to hold everyone to the same unrealistically high standards, whether they’re looking for a million dollars to rehab a community center or just a few thousand to help a loved one in need. Regionally, we are risk averse. We want change to be safe, to be monitored, and to fit into tidy boxes. In our search for new funding resources, we have to find new and creative ways to connect more potential donors to Detroit non-profits. Even when the resources are out there, they come with so many strings attached. You could spend a year or five navigating the maze of red tape, trying to follow a system that isn’t set up for new ideas. We’ve built an infrastructure based on entrepreneurship in Detroit, with a host of resources to help someone start a small business. Yet in the nonprofit sector — where an idea in need of support may not produce an immediate return on the investment — the radio goes silent. We must fix this somehow. We can’t expect the same foundations, the same government grants, the same churches to be able to invest in all of the new ideas for non-profits in Detroit. The system is not sustainable now, so there’s no reason to expect it will get any better any time soon. In our search for new funding resources, we have to find new and creative ways to connect more potential donors to Detroit nonprofits. People who donate often want to feel a connection to the organization – whether its mission addresses a cause they’re passionate about, it has personally touched their lives in some way, or they believe in the people doing the work. To facilitate new connections, what about having a huge expo every year? We could easily fill a large section of Cobo Hall with booths for all of the non-profits in the Detroit metro area. They could be organized in different locations – the non-profits focused on the environment and green space grouped in one location, the education and youth organizations in another, the job training programs, the homeless services, you get the idea. To make it a festive, family-friendly event, we can invite local musicians to play live music and local restaurants and food trucks to supply the food. An annual expo would be a one-stop shop for people who are looking to get involved in Detroit’s comeback but aren’t sure who or what to support. For organizations, they’d have a chance to talk about their work and put on their Sunday best to impress. Plus, it would be just plain fun! We’re at this moment in Detroit’s history where there is optimism in the face of the tremendous amount of work ahead of us. That optimism, I think, stems from our excitement of what Detroit could really be – a true comeback story, a global model for how to rebuild a city the right way, a vibrant city that we will be proud to call home. Without changes now, however, I fear this optimism will just fade into wishful thinking, and many of us will be left to fend for ourselves while we think about what could’ve been. Amy Kaherl is the executive director of Detroit SOUP, which organizes micro-granting dinners that fund creative projects in Detroit. Amy Kaherl talks about building a non-profit in Detroit on "Stateside with Cynthia Canty"